User engagement is an indispensable factor when it comes to online marketing and advertising. Businesses that are engaged with online communities forget to make their content user-friendly and would feed the audience all the services and information they have to offer. Thus, the average conversion rates across industries are only 2.35%. A webmaster only has about 15 seconds to hook the attention of the audience. Within that limited time span, the assurance that your service is trustworthy and beneficial should have reached the audience. This ‘first impression’ is crucial when you want to succeed in the world of online marketing and advertising. User Engagement is when your visitors or potential consumers visit and stay for lengthy periods on your website. To do it, you need a good layout and of course, content that’s interesting, up-to-date and engaging. In addition, when your user engagement is of a higher number, these consumers will often come back to your site for they find your services and content trustworthy. It also means that if these consumers are loyal to you, you will have a higher conversion and increase in visits. There are many ways to keep your audience engaged as far as website visits are concerned. Here are a few examples to give you a better idea. Websites that consists of a gallery can give the audience a lot of ideas of the kind of content and service a company provides. It is also essential to make sure that video and image quality is up to the highest standard. Poor quality of images and videos are discouraging and can lose the interest of the audience. Also known as active participation, the audience has the chance to interact with the webmasters through answer polls, quizzes, and surveys. This kind of user engagement also helps the webmasters know what they can improve in their content as well as the services they provide. As soon as a visitor lands on your site, the first thing they will notice is the design of your homepage. The content should be easy to read as well as easy to go through. As such, the audience will be able to go through what’s in your website with ease. The information that your website contains should be short and concise. If the audience understands the content on your page, the higher the chance they will avail your services. The key to your success is through giving importance to the kinds of user engagement and using them to their fullest. Social media sites such as Facebook, Twitter, Pinterest, and LinkedIn have share buttons to link other audiences to your site. Share buttons also enable the audience to share your content with their friends and peers since almost everyone in the online community has social media accounts. Getting a healthy amount of shares is a good sign that your page is improving. It could also mean for a potential increase in user engagement. One leading cause of higher bounce rates is that some websites aren’t mobile-friendly. Most people nowadays browse the internet through mobile phones. Not being able to capitalize on this trend is a big loss. The user interface of the website on a mobile phone should also be as appealing to the audience as it is on a desktop. A potential consumer will be easily dismayed if they visit your site through their phone and sees stretched texts just as how they look like on a desktop. Another contributing factor for increasing user engagement is the loading of the pages in your site. The audience would not easily lose their interest to your site because it is user-friendly and convenient. Even a one-second delay in the loading speed can decrease user engagement and conversion rates. No one would ever want to read a paragraph that is extremely long. Just one quick look on a paragraph with too much information and words could easily increase the bounce rate of your website. No consumer is interested in long texts, especially when first impressions matter. For better user engagement, paragraphs should only contain 3-4 lines to make it readable. You can also insert relevant videos and images between these paragraphs to make them more interesting. Lastly, the audience should be able to navigate through your site with ease. If the audience is having a hard time finding the information they want, user engagement will dramatically drop, and the bounce rate of your site will increase. One way of overcoming a drop in user engagement rate is including a search box on your navigation menu. Providing a search bar or box on your page enables the audience to find the information they are looking for easily. 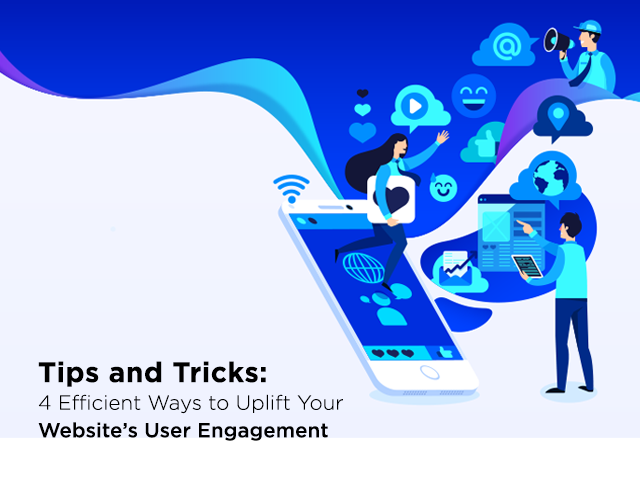 Increasing your website’s user engagement and decreasing the bounce rates can be a tedious task, but with these four efficient ways, you will be able to let your audience stay on your website a bit longer. As a webmaster, you also have to be aware that content must be optimized to prevent delayed loading speed of pages, and it should be readable. All these small things matter for consumers. You could also reach out for SEO Agencies such as KKC Outsourcing about this matter.